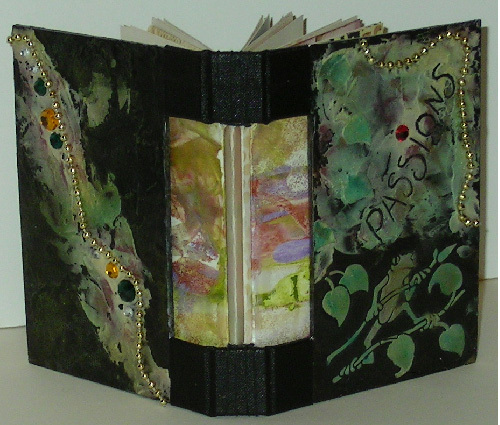 Hand Bound, Open Spine Book "Passions"
This is my first hand bound book, and personally I love it. 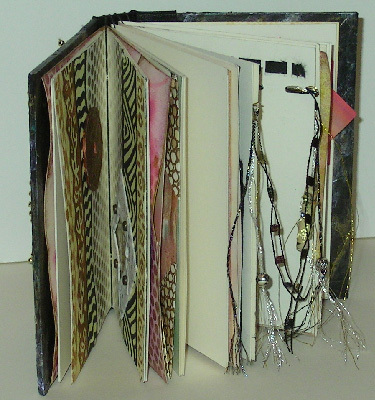 I took a class with Shirl Van Eaton in January 2006 and I think this may become another of my passions. I hope you enjoy looking at the pages in my book as much as I had making it. The front and back were made using Utrecht white gesso (very thick stuff) as a base. When dry I covered it with Bob Ross black gesso. When dry I used texture medium in a tube (almond color) over a frog stencil and also just smeared abstractly. I imbedded a strand of gold beads and some rhinestones. 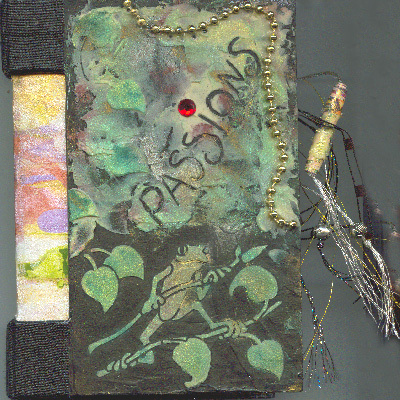 I also carved out the word Passions. 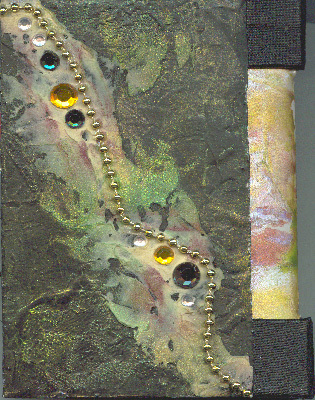 When that was dry, I used several different colors of Brilliance stamp pads as well as Mica Magic and Opalite ( gold's, green's, pink's, rust etc) and rubbed them around to blend. I removed the strand of beads and glued them down. The next few pics are pages within the book. They are all works in progress. As the pages get completed they will be uploaded again. I will be including several different origami holders. The more variety for holding items the better. So I'm always on the look out for good ideas. Hopefully you'll see some that are new for you. 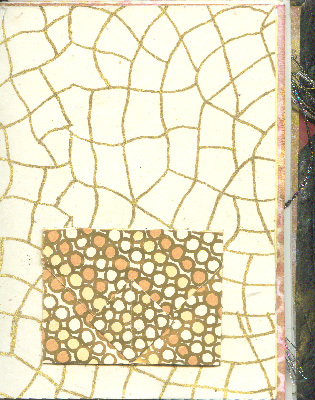 I fell in love with this crackle pattern of paper which I picked up at Stamper's Celebration in 2005. The circle paper is a good quality wrapping paper which was folded origami style into an envelope to store goodies eventually. The inside of the front cover. I only did the white gesso and a layer of black gesso using a palette knife. I dried the layers with a hair dryer and got some crazing which I liked and was unexpected. I used some golden acrylics and some Color Box stamp pads (alchemy set). 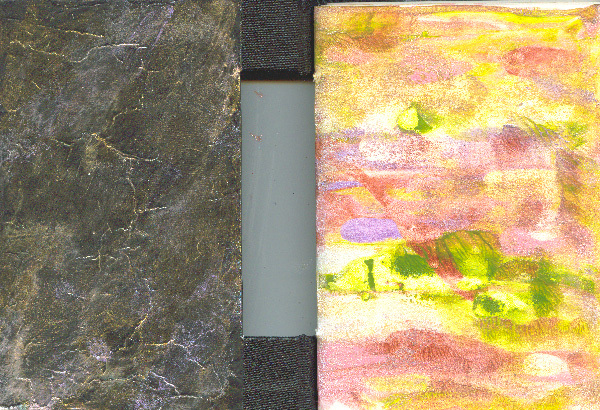 The first signature cover was done using Luna Lights (gold, pink, copper, white some green and some purple), spread over the paper with a palette knife than another layer of paper on top. Rubbed it around and separated the pages. For this spread I cut sections from single layer napkin. Used a rubber stamp pad and some plastic netting to create the circle pattern. I added an origami frame. I used this origami frame several times, sometimes cutting a hole in the signature paper to squeeze the back flaps through to create another look. The right side is another sandwiched Luna Lights page. Those big art deco photo corners are another origami folded item. 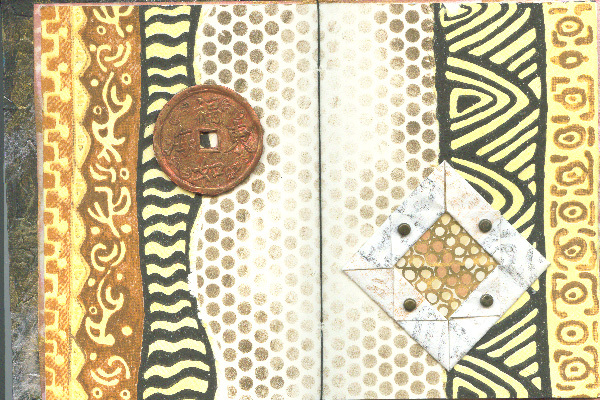 The left side has a soft layer of stamp pad ink in pinks and gold's. It's hard to see the edges of each pocket in this holder, but there are 3 of them which will be filled later on. You can see the back of the photo corners from the previous page and another Luna Lights page. For the right side I used the white gesso and a brass window stencil and put a thin layer over some of the windows. 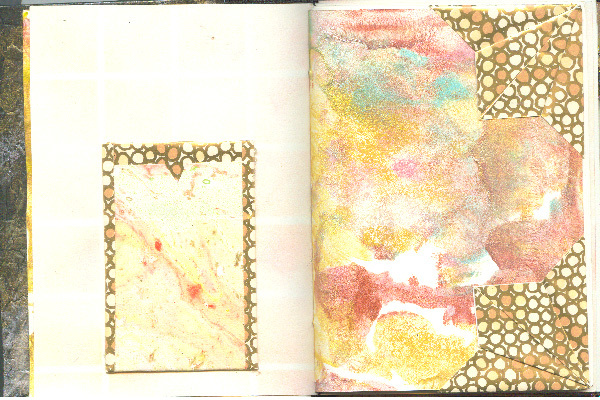 When dry I put the stencil back on and used my stamp pad inks in green, gold and pink. 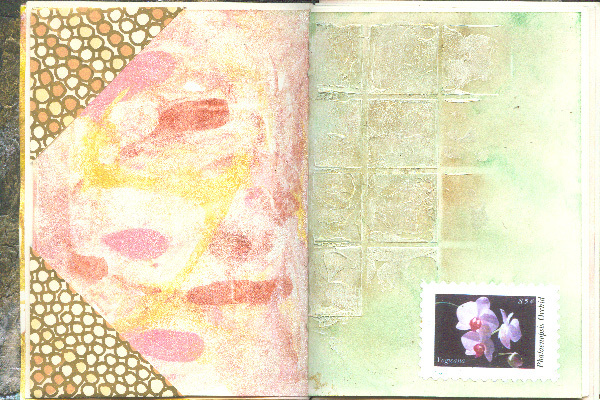 I added one of my faux postage stamps from the orchid series.